Concentrations of carbon dioxide in our atmosphere are reaching levels that haven’t been recorded in human history. 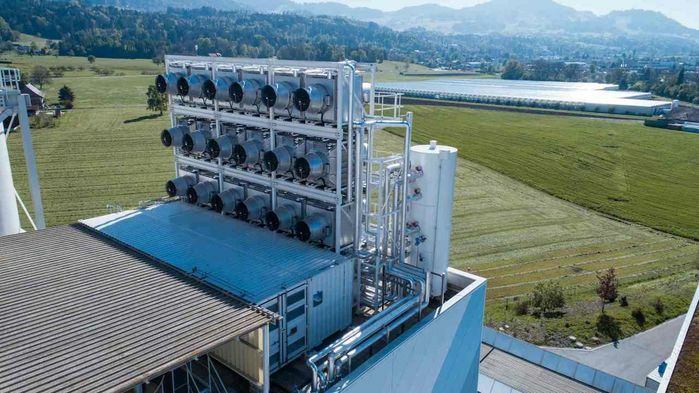 This direct-air capture system by Swiss company Climeworks might help address the problem. The level of carbon dioxide in our atmosphere is becoming untenable – a recent report indicated that it hasn’t been this high in millions of years. Now, researchers in Switzerland are investigating a method of addressing the problem by capturing carbon dioxide from the air. The team is developing a commercial approach to carbon capture at a facility half an hour outside of Zurich. A fleet of 18 fans the size of washing machines have been placed on top of the roof of a recycling center. As they draw in air, chemically coated filters absorb the carbon dioxide. The filters become saturated within a matter of hours, at which point they are heated to 100 degrees C using waste energy from the recycling plant. This allows pure carbon dioxide gas to be siphoned off. This set-up is being called a direct-air capture system, and was developed by the Swiss company Climeworks. It’s capable of capturing up to 900 tonnes of carbon dioxide in a year. In this case, that captured carbon is then sent to a large greenhouse, where it helps enhance the size of vegetable produce. A recent study by Chatham House suggested that we will need to find a way to remove and store carbon from the environment by 2030. We’re seeing various different attempts to make this happen, from efforts to use carbon dioxide as fuel to research into advanced carbon capture membranes. This kind of work is crucial for the continued health of our environment – but there are questions to be asked about how such endeavors will pay for themselves. Removing carbon dioxide from the atmosphere is the goal, but continuing this kind of process indefinitely, without a revenue stream, is impossible. That’s why Climeworks is selling the gas that it collects at just short of $600 per tonne. This figure is currently high because the company has built all of the necessary hardware from scratch. The hope is that, like solar panels and wind turbines, prices will fall once manufacturing efforts are scaled up. Climeworks wants to be able to sell carbon dioxide for around $100 per tonne, and estimates that this might be possible within two or three years. The direct-air capture system could work hand in hand with other efforts to make use of our waste carbon dioxide. Climeworks previously provided carbon dioxide to Audi when the automaker was developing e-diesel, a liquid fuel made by combining the gas with water. At $100 per tonne of carbon dioxide, Climeworks estimates that e-diesel would cost just 25 cents per liter. It will take a broad, multi-faceted approach to address the current concentration of carbon dioxide in the atmosphere. Taking a direct approach to removing it could play a key role.